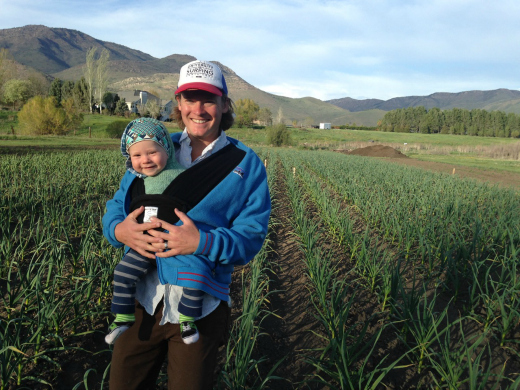 Garlic farmer Pete Rasmussen of Sandhill Farms in Eden, Utah, with a little clove. With fall rains softening the soil, now is a great time to get garlic in the ground for next year’s harvest. Learn how to select and grow great garlic in the home garden or small farm at a lecture and demonstration workshop coming up Saturday, Oct. 29. The workshop takes place from 10 a.m. to 12:30 p.m. at the UC Santa Cruz Hay Barn. 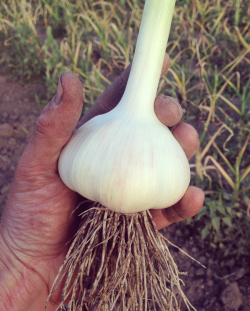 Garlic farmer Pete Rasmussen of Sandhill Farms in Eden, Utah will team with Orin Martin, manager of the Alan Chadwick Garden at UC Santa Cruz, to teach how to select, plant, care for, and harvest a great garlic crop. The workshop will include a discussion of the many varieties of garlic available for planting, as well as soil preparation, fertility needs, seasonal care, and harvest and storage tips. Rasmussen and Martin will discuss how and when to plant garlic, and there will be seed and culinary garlic for sale and roasted garlic to taste. Cost of the garlic workshop is $30 for the general public (pre-registered) or $40 at the door; $20 for members of the Friends of the UCSC Farm and Garden (pre-registered) or $30 at the door; and $15 for UCSC students and limited-income participants (pre-registered) or $20 at the door. For more information or to pre-order seed garlic, call 831.459-3240 or email casfs@ucsc.edu.